I’m sat upstairs at the Estoril Congress Centre having lunch at Behaviour 2017. I attended a great session yesterday on the behavioural approach to understanding the biology of art. This was completely new to me and i’ve put together is a summary followed by some of my thoughts. Ellen Dissanayake introduced us to some of the background and history of art as a subject within biology. It was disheartening hearing about the struggles of her and others at the start to even establish it as an area of study. She brought us to the ‘Artification Hypothesis‘ which, to my best understanding, posits that there are precursor behaviours to (the) art(s). For example, transforming the ordinary into the extra-ordinary, including the purposing of normal behaviours into embellished ones. This follows a structured pattern: Formalise, Repeat, Exaggerate, Elaborate, Manipulate expectations. In this way, art is based on turning typical behaviours into exaggerated rituals. Ellen also discussed how they have been shown benefits of art including unifying groups and reducing stress. Alejandra Wah told us about some of the cognitive processes underlying artistic abilities. She took us through some history the area which started with simply measuring brain responses to the presentation of art. She then introduced the newer field of neuroaesthetics which tries to combine methods of neuroscience with the appreciation for art. However, this area seems to equate art exclusively with beauty. She then went on to talk about how we have 4 cognitive means of processing the environment which build upon and are dependent on each other. These included simple perception through to imagination of absent objects. This is mirrored in 4 meta-cognitive means of processing yourself including knowledge of one’s own experiences. It is the more complicated layers of this such as self-imagination which is argued to be human-specific and to permit art. Larissa Soraffon focused on differences in aesthetic as opposed to social emotions. She started by outlining that art is thought to be something which invokes emotions but that “aesthetic emotions” are ill-defined. She noted that core emotions are phyogenetically conserved across the majority of vertebrates and that evolution tends to build upon rather than create from scratch so perhaps a sense of aesthetic emotion came from more simple vertebrate emotions. She supports this idea by noting that the earliest records of human art coincided with increases in social group size and thus cooperation beyond immediate family. Additionally, humans behaviourally respond to art in a similar way to how they do to people. For example, by showing preferences to familiarity in both. Finally, art appreciation appears to rest upon social brain regions. Piotr Podlipniak took us from the general to the specific by discussing singing as an adaptive human behaviour. He stated that components of singing involve pitch syntax (the fancy way of saying that order of sounds carries meaning) and musical pulse (rhythm). Singing is dependent on, amongst others, vocal control over a base note, perception of certain pitches as units of sound, a learning of order as well as relations of pitches and rhythms. He proposes that the best model for the evolution of singing is the Baldwin Effect in which a learned trait is eventually transformed into an innate one. In this scenario, were singing a learned ability which required much investment but carried benefits to the species then any slight predisposition to do so would have conferred significant benefits and as such spread through the population. So what do I think about all of this? Firstly, I feel an undercurrent across all of the discussions is the prior assumption that art is uniquely a human trait. Whilst it may be so, I don’t feel that we get anywhere starting with such a blanket assumption. Every time traits have been assumed to be unique to humans (culture, teaching, language for example) they have been found across the animal kingdom. Not always to the same extent but certainly equivalent once you start to actually think about what these behaviours are. Secondly, I’d like to extend the cognitive comments about self-imagination and posit that perhaps a function of art is that it allows self-exploration. In a similar way in which play fighting allows animals a safe way to practice hunting skills, perhaps art allowed individuals to explore themselves and how they fit in the world without actually having to do so (and fall victim to that pesky lion). It’s a quick thought and i’m by no means swatted up on this topic but it was one that came to mind. Lastly, I can’t help but feel that, at least at the very beginning, art was a mere byproduct of a freer and potentially more bored brain. Let me illustrate my thoughts with an analogous example. The Bengalese finch, an animal commonly studied for its song learning, is a human-domesticated version of the White-rumped munia (which still lives in the wild). Bengalese finches were taken in by breeders ~300 years ago and selected for nothing more than their plumage; as a result, they show great variety in colouration. As a byproduct, however, they also developed incredible flexibility in their song learning which resulted in a huge amount of variation between individual birds as well as some variation within the individual’s song. This is shown below with the rather straight forward song of the wildling underneath the multipart, multi-ordered domesticated strain. The bengalese have also been shown to respond to sequence order (syntax) appropriately (if you want to know more, search bengalese finch song learning and/or Kazuo Okanoya). It’s been suggested that through domestication the Bengalese were freed from typical natural selection which removed constraints on their brain development which in turn were redirected towards vocal complexity. In this way, through selecting for one trait (plumage) the resulting freedom allowed development of another (song). Further more, sexual selection still operates in this species as females select males based on aspects of their song so despite being removed from natural selection they are still able to experience sexual selection. So what does this all have to do with human art? Well there is a major theory that humans have undergone domestication, not by some external being but by ourselves. You can read about it in Bruce Hood’s ‘The Domesticated Brain‘ or in the 7 points outlined here and there is other evidence including how our brains are now smaller than they once were which tends to occur under domestication. What also tends to happen is a reduction in aggression which is completely compatible with the timing of the first art. This was concurrent with the increase in group size which would have required the promotion of cooperation and in turn selection against the most aggressive. In this situation, selection for cooperativity and against aggressiveness was the driver of self-domestication. The relative increase in safety and freedom afforded by living in substantially larger groups could have permitted lower predation levels, less pressure from natural selection, and thus flexibility in brain development required for the creation of art. This idea has already been put forward for the evolution of language by Okanoya himself as well as here and here thus it is not a novel concept. Once established, art could then have functioned in all the ways currently thought including social bonding, monitoring in-group versus out-group members, and sexual selection (much like the bengalese finch). But the origin and first adaptation would simply be a byproduct of a freer brain living in a larger group. Smart Brains: what is general intelligence and why should we study it? For over 100 years there has been documented a rather remarkable phenomenon that someone who excels at one thing tends to excel at another. This may seem intuitive at first but let’s think about that for a second: why would being good at maths mean you are good at art? Or being good at discriminating between two musical pitches mean you are also good at science? This was first studied by Charles Spearman who, after testing school children on a wide range of both academic and non-academic abilities, found that those who are better at one thing tend also to be better at others (i.e. they maintain a relative ranking among their peers between tasks). This phenomena became known as Spearman’s g for “general intelligence” which proposes that all forms of intellectual ability share some sort of factor, be it mentally or neurologically, the strength of which determines your relative ability to perform tasks. 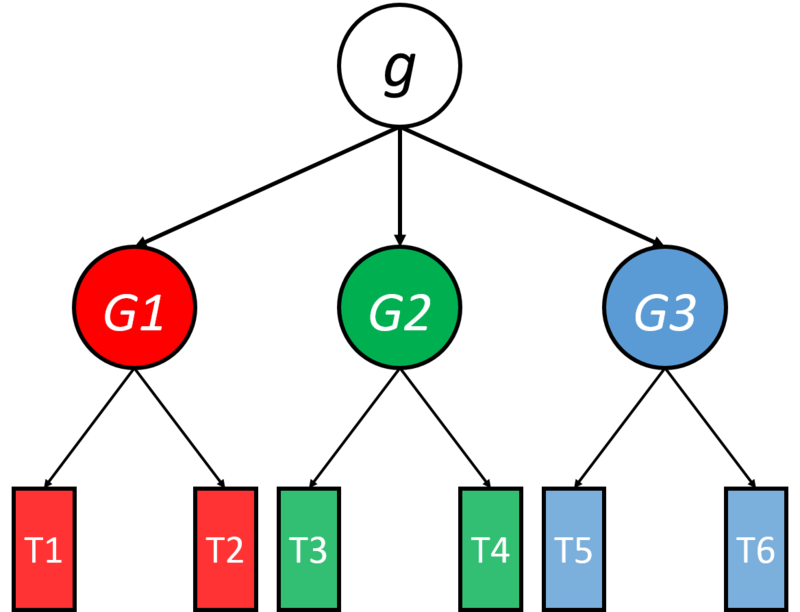 In this image g is at the top and under it are groups of abilities (G1-G3; e.g. use of numbers, space, and memory), and under these are specific tasks (T1-6; e.g. spotting patterns, noticing differences, adding numbers). Since the original study this has been replicated numerous times across ages, cultures, contexts and using multiple sets of tests, and the evidence is overwhelming: abilities correlate. Why this is true is less certain, but some progress has been made towards understanding what goes on in the brain to underlie this. One of the most likely explanations is that g relates to the speed at which brain cells communicate. As this is a factor which would affect the brain at all levels, it is possible that small differences between individuals would cause differences in information processing. This has been supported with a huge amount of evidence suggesting that general intelligence correlates with reaction times, such as responding to a particular stimulus. Thus the genes and upbringing which build a faster brain may just be building a better and faster system in general, and this manifests as correlations in mental abilities. The idea is far from without criticism, however, as different theorists have postulated different models which range from there being a few “types” of intelligence up to hundreds. A well-known alternative is Cattell’s model of fluid and crystallised intelligence. The former is involved in problem solving, and the latter in knowledge which is accrued by the use of the former over your life. G is also criticised for being a statistical artifact and not a biopsychological phenomenon (i.e. nothing to do with the brain); that choosing to use statistical tools which look for a single factor to explain your observations means you’re more likely to find one. Despite this, measures of g (or close approximations such as IQ tests) have been found to predict job performance, income, health, and susceptibility to certain mental disorders. This whistle-stop tour of Spearman’s g was intended to be just that: a tour. There are many a good review and webpage out there which delve into the topic is much greater detail (a quick google search for “general intelligence” or “spearman’s g” which return you many). What I felt was missing however was information on what is known in non-human animals and what this can tell us about the nature of general intelligence. What I present next is again by no means everything which is known but it will illustrate a few trends and hopefully inspire you to read on about this fascinating phenomenon. In our closest relatives, the primates, innovation, social learning, tool use, removal of food from enclosures such as cases and skins (extraction), and social manipulation was found to correlate across 62 species. Whilst another study found differences in the abilities of 7 species, this suggests that a well-rounded intellect is at least a general feature of the primates. So what about other mammals? Most work has been done in rodents and has largely supported the human evidence. The abilities of mice tested on navigation, aversion to negative stimuli, distinguishing between smells, and associating a sound with a reward all correlated. Another study found that similar abilities were also correlated with the ability of mice to hold information in their working memory, suggesting that the rapid use of information is a key part of intelligence. Whilst a single study found that location learning, working memory, the ability to direct away from a goal and the ability to detect novelty did not all correlate, it has largely been found that abilities do correlate in mice. Support also comes from dogs tested on their ability to learn new rules and recognise new objects, and the speed of their reactions. In our feathered cousins most work has been done by looking at vocalisations, such as how birdsong relates to learning. Songbirds learn to sing at least in part from a tutor, such as their father, and the number of notes a zebra finch sings has been shown to relate to how fast they get to grips with a food location task. The total number of songs a song sparrow sings, however, has been shown to be inversely correlated with their ability to learn the spatial arrangement of food (i.e. the more songs they have the slower they learn). This suggests that at least in song sparrows, investment in song-learning and other forms of learning may be traded off against each other. Other work in birds has revealed mixed results with some and no correlations in abilities depending on the tasks involved. What does this tell us so far? It is interesting to note how conclusive the human evidence is, that in primates and other mammals it’s near enough solid, but that in birds it’s all over the place. What does this mean? It could be telling us that fundamentally the mental abilities of mammals and birds went in different directions. Namely that mammals became well-rounded flexible problem solvers whilst birds because more specialised. Both approaches have their benefits. Being highly flexible means you are more likely to survive abrupt changes to your physical and social environment. If early mammals lived, and continue to live, in an unstable environment for one reason or another then perhaps having a brain geared towards general flexibility would be advantageous. Conversely, different bird species may have divided very quickly into small niches with particular demands and thus would be better suited to being strong at the particular abilities needed for their lifestyle without regard for others. However, drawing any conclusions is very difficult as only a limited number of species have been looked at in this regard, and whilst primates are well studied we don’t have examples from the full range of either mammals or birds, never mind reptiles, amphibians, fish or the plethora of invertebrates! It is interesting however that so far there seems to be a difference between the mammals and the birds. What can be gained from studying this in non-human animals? Studying non-human animals brings us insights which studying just humans can’t. Firstly, the ability to manipulate systems to gain a greater understanding of how they work. Tentative evidence regarding brain size and genetics exists in humans but with other animals the specific substructures of the brain and their involvement in the different parts of learning can be studied: what makes them different? How does that translate into the differences we observe? We can study the fine-scale genetic, biochemical, physiological, and anatomical changes involved to create a much fuller picture of learning in general. It is also known that issues during early life such as nutritional deprivation or poor parental health can affect someone’s abilities in adulthood. With this observational evidence we can look at the development of other animals to work out when and why early life and other periods are so important. Secondly, evolution. Positive correlations in mental abilities create problems for those models of brain and behaviour that suggest the brain contains a series of systems which specialise in independent functions. For example there would be a separate system for detecting changes in the environment, another for learning to speak, and another for learning what’s good to eat. By studying non-human animals we can learn more about differences in how these abilities are organised both within and between individuals, as well as within and between species. Thus the “mind” as we understand it may have evolved differently multiple times and for different functions in different groups of animals. Finally, and perhaps most importantly, for a greater understanding of one of many fascinating aspects of nature. Studying more abilities in more animals only adds to the wealth of knowledge that we as a species are so good at. The scientific-ape that we are always strives to learn more and that in itself is surely the greatest reason to delve further in our attempt to unravel the nature of general intelligence. Whilst our bodies strive to fit in with the day and night, the modern social world imposes its own demands on our internal clock which can cause disruptions to our natural sleep patterns. A recent study at the Universities of Surrey and Texas demonstrated that mistimed sleep can cause significant disruption at the genetic level to our internal rhythms. All animals live in a world dependent on two of nature’s ‘clocks’: the biological and the solar. The biological clock presents itself in cycles of behaviour, physiology, and gene expression approximating the 24 hour day and are thus known as circadian rhythms (‘circa’ about, ‘dies’ day; Latin). The solar clock is the light-dark cycle we are all familiar with and with which we synchronise our sleeping and eating. When these two clocks align we get well timed sleep and our associated internal rhythms synchronise, however mismatch between the clocks is known to significantly affect an individual’s hormonal cycles and mental function such as alertness. In general, proper sleep cycles underlie good health and strong internal synchronisation. Until recently the biological and solar clocks have sufficed in the lives of humans. However, the development of the modern world has introduced a third ‘social’ clock. This is any factor relating to society which causes us to change our sleep cycles. For example, shift-workers such as nurses work long and changing hours out of sync with the biological and solar clocks. This means no routine sleeping pattern is attainable. Another modern instance is that of jet-lag: when we cross time-zones we gain or lose hours which effectively shift our normal sleep time. I’m sure many of us have experienced the effects! Overall this means that the effect of living in the modern world pushes and pulls us against the natural rhythms inside us all. The human circadian system starts in a small brain region behind the eyes known as the ‘supra-chiasmatic nucleus’ which synchronises the rhythms of the brain and the rest of the body via neural, hormonal, and behavioural changes. Circadian rhythms operate at every level from gene expression, through physiology, to behaviour. However, whilst it is known that sleep disruption affects behaviour and physiology, it was unknown if this is true at the genetic level. The current work addressed this by measuring the effect of sleep disruption on the expression of a wide range of genes to assess what processes they relate to. They used a ‘forced desynchrony’ method which involved measuring participants natural sleep patterns via activity monitors and sleep diaries for a week before adjusting their routines to a 28 hour day. This led to an approximate increase of four hours each day to their natural cycles, pushing sleep onset four hours later compared to the natural world. The study took blood measurements to assess the rhythms of a circadian hormone called melatonin, which normally peaks during the period when you are usually asleep. They then used samples taken when sleep did or did not align with this peak of melatonin to compare levels of gene expression between normal and mistimed sleep. They found that total sleep time decreased as sleep rhythms fell out of time with the melatonin signal. They found that when sleeping normally roughly 6% of the measured genes were expressed rhythmically, dropping to only 1% as sleeping was shifted. These were largely involved in switching on and off other genes. These genes were also expressed more than usual, whereas genes involved in metabolism were expressed less. This suggests that not only does disrupted sleep result in genes being expressed out of sync with the body, but that it actually changes the proportions of those which are expressed. They then compared results of this study to one of their previous studies1 which looked specifically at reduced rather than mistimed sleep on gene expression. They found that both forms of poor sleep lead to disrupted gene expression, but relating to quite different processes. Taken together, these results demonstrate that poor sleep (be it at the wrong time or not for long enough) have significant impact on the expression of a wide range of genes. Further understanding the impact and mechanisms of sleep and circadian disruption can help us to create interventions for those at risk of developing social clock-related issues, such as shift workers and those who have to cross time-zones frequently. It also will help to develop aids for those with sleep disorders and to identify the potential markers that lead to such problems. Möller-Levet, C. S. et al. (2013) ‘Effects of insufficient sleep on circadian rhythmicity and expression amplitude of the human blood trancriptome’. Proceedings of the National Academy of Sciences, 110 (12), E1132-E1141.